Great Lakes Apparel Inc.offers top quality with fast turnaround and competitive pricing. We offer a large selection of tshirts, fleece, jerseys, spiritwear and promotional items. fundraisers. Please view our complete line of products to make your selections. Call or email us today on promotions and special buys! Our artwork department can offer many logo ideas for your team, school or spiritwear. Don’t forget to ask about Jersey Printing and Numbering! ideas for Corporate, Team and School Apparel. Please send all artwork in a VECTOR format. Other software files can be exported as an .eps or .pdf. 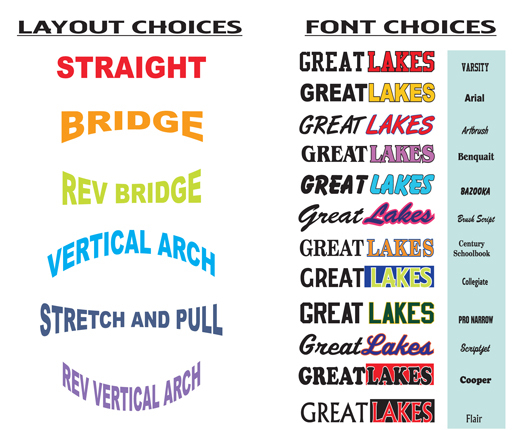 Please see the Layout Choices and Font Choices for you to choose from.